Non E Halloween Senza Zucche [D8875] - $12.22 : Yarn Tree, Your wholesale source for cross stitch supplies. Cross stitch pattern by Cuore e Batticuore. This Halloween pattern features a couple of girls dressed up to go trick or treating. One girl is holding her pumpkin treat or treat bag pulling a wagon with another girl holding a pumpkin. 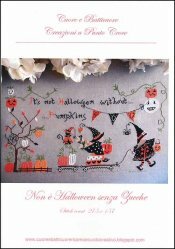 The saying, "It's not Halloween without.....Pumpkins," is stitched at the top of the pattern. The word, "Halloween," has a banner with the word "BOO" hanging from it. A fall tree with pumpkins is stitched on the left side of this pattern. Stitch count 275 x 157. Stitched on #8684 Belfast Smokey Pearl.